the more loyal customers are, the more you can count on a “core group” of regular clients. A restaurant owner must therefore be surrounded by competent staff well-suited to their roles, ensuring good and constant internal communication, training and motivation of the team. 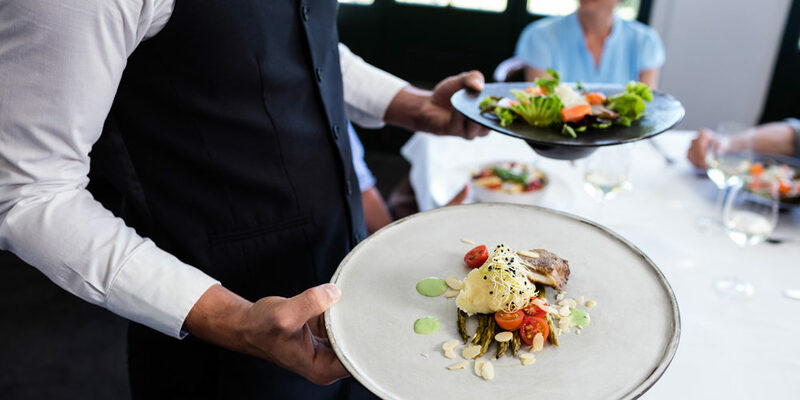 What are the characteristics and tasks of good dining room service staff? Hospitality. Dining room staff welcomes the customer; friendliness, helpfulness, a positive attitude, excellent appearance, and courteous speech and behavior are essential. Preparation. Dining room staff must be able to introduce the site and tell its story to help the customer live the experience. They must know the menu and specialties, the technical terminology and know how to serve properly at the table. Staff must also be adept at suggesting dishes and combinations, providing helpful advice without being invasive. Timing. A good customer service representative knows how to calculate and respect times, knows when to carry out the orders, offer dessert and coffee or clear the table. Most important – never rush your customers! Problem-solving. Resolving crises with speed, efficiency and agility is not natural for everyone, but it is a skill to be cultivated. Listening. Listening to the customers and asking the right questions helps to understand what they want and to anticipate their needs. Customer loyalty. Recognizing and taking care of regular clients, spending time with them, calling them by name, and anticipating their requests help to strengthen relationships. Open eyes. The aim is to make our customers grow fond of the place, so responsiveness, receptivity and attention to detail are always pertinent. Would you like to have satisfied customers? Focus on the service, and leave the dishes to us!